Nestled in a high bowl of lush alpine meadows, Lake O’Hara hiking is the best in the Canadian Rockies. Located 11 kilometers (6.8 miles) from the nearest public road, the lake is surrounded by dozens of smaller alpine lakes and framed by spectacular peaks permanently mantled in snow. As if that weren’t enough, the entire area is webbed by a network of hiking trails established during the 20th-century by luminaries such as Lawrence Grassi. 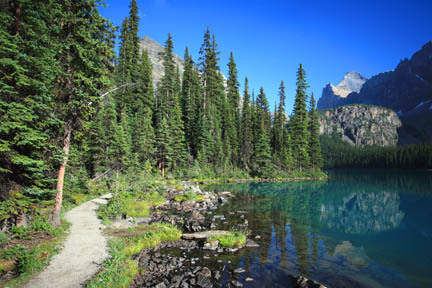 Trails radiate from the lake in all directions; the longest is just 7.5 kilometers (4.7 miles), making Lake O’Hara an especially fine hub for day hiking. What makes this destination all the more special is that a quota system limits the number of visitors. Click here for the Lake O’Hara bus schedule for 2019 and other booking information. Most people use sections of this easy loop around Lake O’Hara to access the trails, but it is an enjoyable walk in its own right, especially in the evening. Across from Le Relais, behind the warden’s cabin, interpretive boards lay out the various options throughout the valley and explain local history. Heading in a clockwise direction from this point, the trail crosses Cataract Creek, the lake’s outlet, then passes along the north shoreline, crossing gullies, and then reaching Seven Veil Falls at the 1.2-kilometer (0.7-mile) mark. Traversing the cool, damp, southern shoreline, the trail passes branches to the Opabin Plateau and a short detour to Mary Lake. Lake O’Hara Lodge is passed at the 2.4-kilometer (1.5-mile) mark, from where it’s a short stroll back along the road to Le Relais. 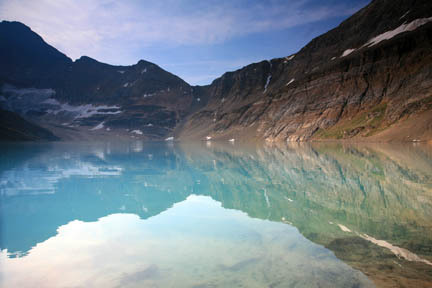 With the Continental Divide peaks of Mount Victoria (3,464 meters/11,365 feet) and Mount Lefroy (3,423 meters/11,230 feet) as a backdrop, this small aqua-colored lake surrounded by talus slopes is one of the area’s gems. All the elevation gain is made in the first 2.4 kilometers (1.6 miles), as the trail switchbacks to a ledge overlooking Lake O’Hara. The trail then levels out, passing three small bodies of water before climbing over a low rise and entering the cirque in which Lake Oesa lies. Separated from Lake Oesa by 2,848-meter (9,344-foot) Mount Yukness, this plateau high above the tree line dotted with small lakes is one of the most picturesque destinations in the Canadian Rockies. The time quoted is an absolute minimum because it’s easy to spend an entire day exploring the alpine plateau and scrambling around the surrounding slopes. Two trails lead up to the plateau, which itself is laced with trails. The most direct route is the Opabin Plateau West Circuit, which branches right from the Shoreline Trail 300 meters (0.2 mile) beyond Lake O’Hara Lodge. 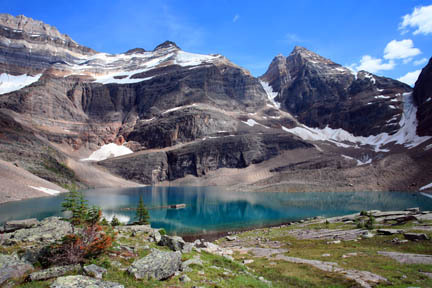 It then passes Mary Lake, climbs steeply, and reaches the plateau in a little less than two kilometers (1.2 miles). Opabin Prospect is an excellent lookout along the edge of the plateau. From this point, take the right forks to continue to the head of the cirque and Opabin Lake. This section of trail passes through a lightly forested area of larch that comes alive with color the second week of September. From Opabin Lake, the East Circuit traverses the lower slopes of Yukness Mountain, passing Hungabee Lake, then descending steeply to Lake O’Hara and ending back along the Shoreline Trail 600 meters (0.4 mile) east of Lake O’Hara Lodge. A personal favourite, this trail leads to the largest and (in my opinion) most stunning body of water in the Lake O’Hara area. Beginning from behind Le Relais, the trail passes through an open meadow and the Elizabeth Parker Hut; stay left to reach Schaffer Lake after 1.6 kilometers (one mile). At a junction beyond that lake, the left fork leads to Lake McArthur and the right fork to McArthur Pass. The lake option climbs steeply for 800 meters (0.5 mile), then levels out and traverses a narrow ledge before entering the Lake McArthur Cirque. (Stay high, even if trails descending into the McArthur Valley look like they offer an easier approach.) After leveling off, the trail enters the alpine and quickly reaches its maximum elevation and the first views of Lake McArthur. Backed by Mount Biddle and the Biddle Glacier, the deep-blue lake and colorful alpine meadows are an unforgettable panorama. 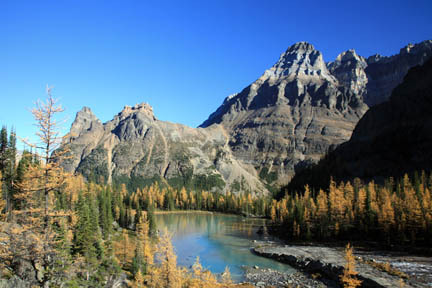 For a panoramic overview of the Lake O’Hara area with a minimum of energy output, it’s hard to beat this trail, which ends atop the Odaray Plateau west of the lake. This trail passes through an important wildlife corridor, and a voluntary program to limit use–and therefore human interference–is in place. Check with park staff for the latest access restrictions. From Le Relais, follow the Lake McArthur Trail to Sch<\#143>ffer Lake as detailed previously, then take the right fork, which climbs gently toward McArthur Pass. Just before the pass, take the right fork. From this point, it’s a steep one kilometer (0.6 mile) up to the lofty perch below Odaray Mountain. The trail out to Cathedral Basin is the longest in the Lake O’Hara area, yet it’s still an easy day trip for most people. Reach the trailhead from Le Relais by walking the short distance back down the access road or by following Cataract Creek downstream from behind the warden’s cabin. From the campground the trail heads northwest, crossing Morning Glory Creek at the 2.4-kilometer (1.5-mile) mark, then passing Linda Lake. The final ascent to Cathedral Basin makes a wide loop through an area of ancient rock slides. From this point, the magnificent panorama of the Lake O’Hara area and the backdrop of the Continental Divide are laid out to the southeast.